Native American Languages Native American Tribes What's new on our site today! 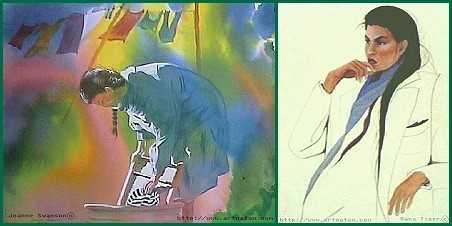 Painting is one of the most popular art forms people mail us about. It's also one of the least traditional American Indian art forms. There were native painting traditions in many tribes, but they were almost all decoration for functional items, such as paintings on leather war shirts or tipi covers, or else inherently non-portable, such as painted petroglyphs on a nearby cliff face. 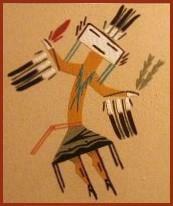 One exception is Navajo Indian sandpainting, which was originally a spectacular religious art. Today some Navajo artists make secular versions of traditional sandpainting which can be purchased as cultural art. Other contemporary Native American artists have adapted Western painting styles to depict their own people, experiences, and worldviews. Though the techniques of these paintings are not traditionally Indian, the styles, designs, and subject matter reflect the artists' tribal heritage, and many of them are stunningly beautiful and incisive. It seems like there are hundreds of non-native painters out there churning out mediocre pictures of unbelievably inauthentic Indian maidens contemplating wildlife scenes and then marketing these as "Native American pictures." Well... they're not. In many cases, the person painting them has quite clearly never even SEEN a Native American person. So if you're looking for paintings or prints that were actually made by Native Americans, either because authenticity is important to you or because you want to support native people with your purchase, here is a directory of American Indian artists whose work is available online. If you have a website of Indian paintings or prints to add to this list, let us know. We gladly advertise any individual native artist or native-owned art store here free of charge, provided that all pictures were made by tribally recognized American Indian, Inuit, or First Nations artists. Thank you for your interest in American Indian art! On our main site we do our best to avoid slowing down our page loading with graphics, but this page is about art, so we'd really be remiss in not showing a few representative pictures of American Indian painting. All photos are the property of their respective artists; please visit their sites to see their work in more depth. A terrific collection of contemporary portraits and paintings by native artists Joanne Swanson, Dana Tiger, L. David Eveningthunder, Urshel Taylor and the late great Jerome Bushyhead. All proceeds go directly to the artists. Beautiful selection of impressionistic native prints by a Dakota Sioux artist. 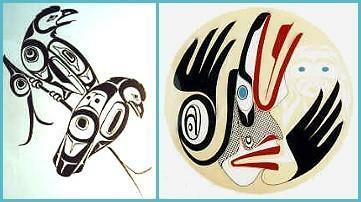 Collection of prints by Canadian Indian artists, particularly Northwest Coast tribes. Not all of them have price information online--inquire by email if you are interested in one that does not. This Navajo family craft shop offers sand paintings in both traditional and more touristy designs. Don't miss the most beautiful yei figures and mesa silhouettes near the bottom. The least expensive way to admire a piece of native-made art. 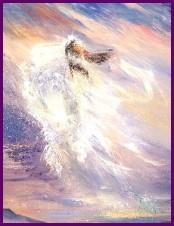 We've moved the Native American Greeting Cards to their own page now; visit them there! Excellent survey of 20th-century Indian painting from the Philbrook Museum of Art. Beautifully illustrated guide to traditional and modern Navajo sandpaintings. A good book on American Indian art history in general, from ancient times to today. Book by a Cree scholar on contemporary First Nations art. What constitutes Indian art fraud, and how to report it if you find it. Indian Arts and Crafts Association: Addresses of Native American artists who are members of the IACA. This is a great way to find local tribal artists who don't have websites. and photographs and reviews of contemporary Indian artists. Native American Artist Resources: Links to Indian art cooperatives, interviews, artist pages, etc. 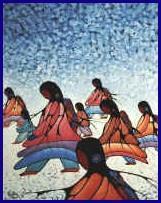 Native American Visual Art: Orrin contributed to this larger directory of Indian paintings and crafts, many of which are authentic. Native American Cultures: View our pages for individual Indian tribes, most of which have artistic information. About us: This website belongs to Native Languages of the Americas, an indigenous language nonprofit organization dedicated to preserving and promoting endangered Native American languages. We are not artists ourselves, so if you are interested in buying some of the artwork featured on this page, please contact the artists directly. Though we have featured only American Indian prints and paintings identified with the name and tribal affiliation of each artist, we haven't called the tribal offices to check up on any of them, and we only know a few of them personally. We also don't guarantee any of their products. This is not an exhaustive list of native painting--if you would like us to add your art site to this page, please contact us with your URL and tribal affiliation. We advertise any individual native artist or native-owned art business here free of charge. We do not link to prints or portraits which are not made by tribally recognized American Indian, Inuit, or First Nations artists, so please do not ask us to. And finally, websites do occasionally expire and change hands, so use your common sense and this general rule of thumb: if the creator of each individual artwork is not identified by name and specific tribe, you are probably not looking at a genuine Native American painting.